When you have a need for power that isn't satisfied by a normal brushed motor, it's time to step it up a notch with a precision-built hand wound motor! The Holmes Hobbies TorqueMaster Pro 540 is a hand built with the finest parts and construction techniques available. We guarantee the finest and most up to date construction in our Pro motors. With podium spots and overall wins at state, regional, and national events worldwide, this motor is the proven winner! 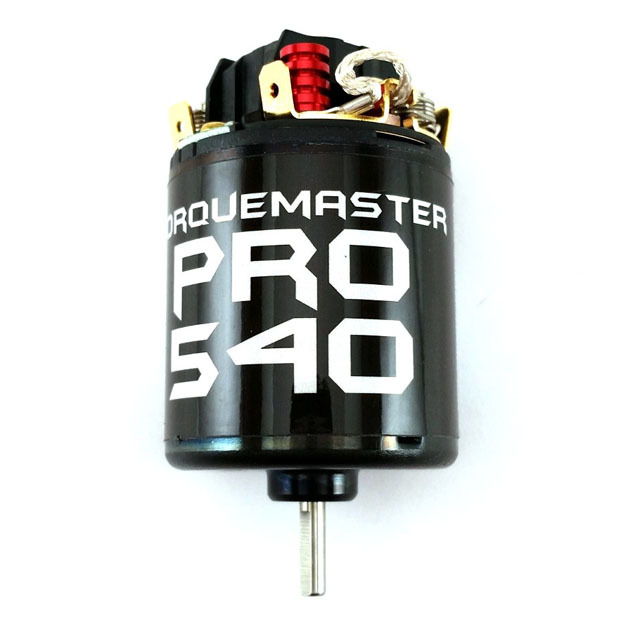 When you want the best 540 motor, choose the TorqueMaster Pro! Hand-Wound Armature – Our pro-level armatures feature pattern hand-wound coils for highest power and efficiency. Wind termination is reinforced using high-temp silver alloys, with state of the art resin impregnated coils. All armatures are then precision epoxy balanced and the commutator is diamond trued. All armatures are marked with wind. One cannot build a finer or more precise armature! Timing: 6 degrees of advance is popular and will not adversely affect motor life. When buying pairs of motors with the vehicle indicated, we will speed match and mark motors front and rear at no extra charge. Wind: Chose your preferred motor speed. If not in stock, you can order as a custom and we will wind it for you. Every brushed motor carries a 30 day warranty to cover manufacturing defects. Damage caused by improper gearing is not covered under warranty.